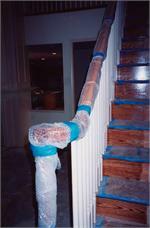 Handrail & Guardrail Protection film is easy to install. HandrailWrap protects using an adhesive durable bubble wrap. HandrailWrap handrail protection with no adhesive is a handrail protection and guardrail protection film designed with a bubble cushion top. HandrailWrap offers a 3/16" thick surface protection. To install simply tape in place with blue masking tape.